Yet More on Basel III! Felix Salmon passes along the news that the new Basel III capital requirements will be announced this weekend. Can you feel the excitement? He also links to a new BIS report that asks: What’s the effect of higher capital standards, anyway? Banks argue that it will increase the cost of borrowing and therefore slow economic growth, and they’re probably right about that. However, it will also reduce the frequency and severity of banking crises. So what’s the net effect? I’ve added the green lines to roughly show the pre-crisis trend level. In some cases (notably Mexico) this obviously overstates things, since the pre-crisis growth rate was probably unsustainable. But in most cases it looks as if the effect is a permanent reversion to a lower output baseline that never gets made up by higher growth — at least not in the medium term of 20 years or so. 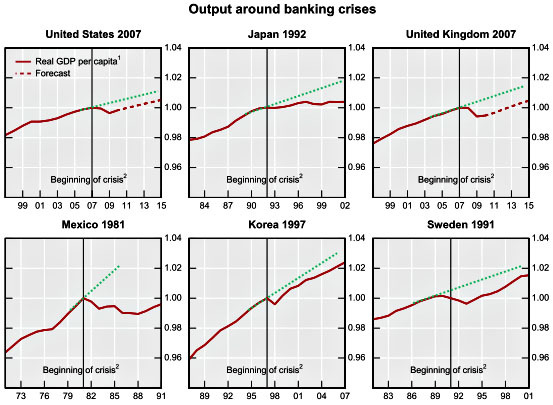 The BIS report offers up several explanations for why this is so, but the bottom line is simple: banking crises appear to have a large and permanent effect on the output level. It’s worth paying a small price to avoid them. 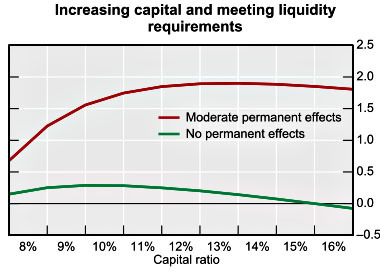 This chart estimates the long-term effects of higher capital ratios and liquidity requirements after the transition period to the higher requirements is over, and the results are pretty stunning. If capital requirements increase from 7% to 12%, the net effect on the annual level of output is nearly two percentage points upward. The BIS report analogizes this to a burglar alarm in an art museum: it costs you a little bit every year, but it’s well worth it if it prevents the theft of a priceless masterpiece. All of this is arguable, of course, and depends on your estimates of the cost of banking crises vs. the cost of higher capital standards. But if the BIS is even in right ballpark here, higher capital standards are a slam dunk. We’d be idiots not to adopt them. UPDATE: I’ve reworded this is in a few places to make it clear that we’re talking about permanently lower output levels here, not permanently lower growth rates. Japan and Mexico do show lower growth rates, but the main point of the BIS report is that banking crises cause an output shock that can only be made up by several years of above-average growth, and that doesn’t seem to be the norm.